Lucius Cornelius Sulla Felix; his self written epitaph reads "no friend ever served me, and no enemy ever wronged me, whom I have not repaid in full". The truth about Sulla's life and exploits has always been there to be seen. It took a brave person like Lynda Telford to put it all down in writing. Swimming against the stream is hard enough. Fighting your way through two thousand years of history is quite another adventure, although the author's membership in the Richard III society may have helped her prepare for this struggle. Sulla: the name exudes anathema to most historians. All stories have to have a villain, and to most he fits the bill admirably. But does he? A soldier and general of the highest caliber, he was a dictator of Rome, the first dictator in Rome's long history not to have a time limit on his authority. He killed, outlawed, and even murdered. So he must be the demon we have read about. As I said, every story needs a villain and a hero. History has chosen the hero in our play, Julius Caesar, a man who refused to bow down to Sulla's will and divorce his wife. Technically true, but there is more to the story. Only two men bearded the old lion that was Sulla. Gnaeus Pompeius Magnus and Caesar. Of the two, Pompey stayed in Rome, whilst Caesar ran to the edge of the Roman world after his slight tug on Sulla's mane. He was one of only eight Romans to win the coveted Grass Crown before it was sullied with Octavian's honorary one. To me, Lynda Telford's book is a milestone. It brings to life a principled man who should have had the acclaim of the Roman world in which he lived. Instead he was, and is, vilified for his choice of friends and lovers. He was principled, and he did have a reason for what he planned and carried out. He was a patriot who saw Rome falling from a republic to chaos in front of him. He was born just before the upheaval of the Gracchus brothers. The Gracchus brothers also had a plan, a good and true one. Their problem was that they were willing to flaunt all of Rome's laws to see it through. From their lives and deaths you see the fall of the Roman republic. Demagogues, money, and violence became the way of politics in Rome. Sulla was trying to put an end to this, and to strengthen the senate, and return Rome to a land of its laws. The author has picked an incredible man for her work. She has also picked a huge fight with history. If Caesar is a hero, then Sulla must be a villain. Sulla is not only vilified for his actions, but also for his way of life. He is the only openly bisexual person in all of the famous men of Rome's historical record before the empire. I say openly because he himself stated that the male actor Metrobius was the love of his life. I think it is high time (as does the author) we look at his life without the blinders of previous centuries prejudices. That I agree with the author's premise is very much a given. To me, Gaius Marius and Caesar were both heading Rome so that it might be ruled as a personal empire, naturally with them or their family as emperors. Sulla tried to put a stop to the violence and chaos of the last forty years. He wanted the republic back in all of its glory, and strong within its laws. The author shows Sulla warts and all. She does not make excuses for him, but tries to explain his actions. There are many people who disagree with her portrait. Caesar finally conquered in the end. His own plaudits of his career have been used to teach Latin for two thousand years. 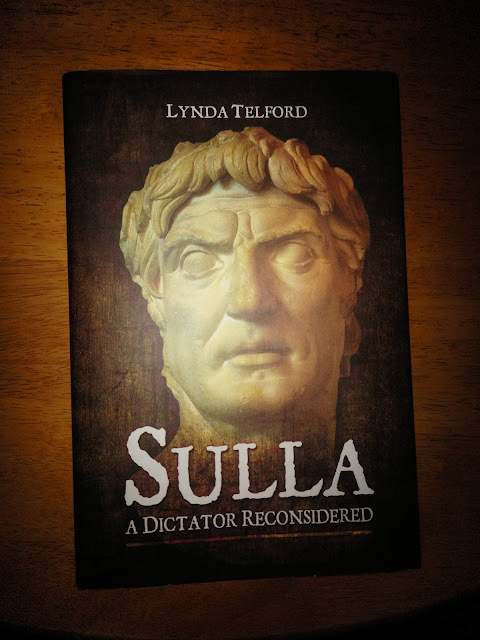 While Sulla, who became a dictator and then voluntarily gave up that power, is reviled instead of being praised as another Cincinnatus. Readers, please try and keep an open mind about the author's portrait of the life of the colossus that was Lucius Cornelius Sulla Felix. The author brings his life and times to us in it's full panoply. I heartily recommend this book to anyone who has even the slightest interest in the history of the later Roman republic. Hopefully, she is hard at work on a biography of Pompey. In the meantime join me on every Ides of March, and raise a toast to Sulla and Pompey. I would be honored. I apologize for not answering your first email, but I was overawed that an author had actually posted here. If you didn't mind could you add the web address of the blog? We share in common two maligned historical figures. May I ask what your take is on the prince's in the tower? Many thanks for permission to use your brilliant review of Sulla. Re the princes, I personally think that the elder boy may have died of natural causes and I have a leaning towards Perkin Warbeck being the younger one. Interestingly, nobody ever claimed to be the elder boy! Richard had no reason to kill either of them...he hadn't harmed Clarence's son so why harm boys who were officially illegitimate? I am Events Officer for Yorkshire Branch of the R3 Society. Are you an R3 member? Sorry my second book was not about about Pompey, but "Tudor Victims of the Reformation" just released. My third one, "Women in Medieval England" is contracted to Amberley, though I'd love to do "Sulla and the Social Wars" sometime, revisiting my favourite Roman. Dear Robert, If I send you an email address to send your review for publishing in the Society of Ancients journal, could you send it as a pdf file please? Regarding your enquiry about the princes in the tower. I thought you may be interested in this report from the RIII Norfolk Branch study day. Keynote presentation by Philippa Langley MBE. Of the "Bones in the Urn" in Westminster abbey, modern research suggests these may be female and should certainly be re-examined. Philippa references each of the written sources from Mancini in 1483 to Shakespeare in 1592, but showed a lack of uniformity in the writings which consist of rumour, hearsay and gossip, showing that murder was not a "given" as there were equal rumours for survival. Asking what was the motive for murder. Richard could not have benefited without displaying the bodies. She then examined the chances of survival of the boys, concluding that the Woodville sisters (and Richard) knew that one or both of the boys were alive and well in Burgundy, leading to the balance of probability that Perkin Warbeck was indeed Richard Duke of York, bearing a very strong facial resemblance to King Edward IV, with a cast in his eye and distinguishing birthmarks. It would surely have been Henry VII's trump card to introduce "Perkin" to his own Queen Elizabeth or to the Dowager Queen Elizabeth Woodville, so they might denounce him as an imposter, but this he singularly failed to do. I hope you find this interesting and informative. I would like to hear your thoughts on the matter. By the way, would it be possible to send the pdf review? and of course this website would be mentioned in the journal of the Society of the Ancients. Sorry, it was a holiday here so I was busy. Blogger doesn't play well with other programs I will have to type it into PDF format.I will do that asap. As far as the prince's go, I never thought Richard did them in. If he had there would have been some talk and Henry Tudor would have certainly shown them or it. They were a liability much more for Henry than Richard. My main anger was toward the 'crookback' crowd. Having swung real weapons, I knew he could not have had as much abnormality as has been made out. I have the PDF version now, Jason on the blog helped me with it. Just let me know where to send it or you can get a hold of us through our FB page. It is the same, a wargamers needful things. I do not have a Facebook page but I will get my friend Linda Halliday to private message you from her Facebook page with the name of the man and the email address to send it. Thanks again.